Inscribed, as title, and signed by artist, lower right. The yacht is the former America's Cup challenger, 'Thistle', which had been laid up at Gourock on moorings until bought by Kaiser Wilhelm II and refitted. He raced her for the Queen's Cup at Cowes in 1893 and despite having many guests including Wyllie on board with him, she won. This drawing was reproduced in 'Sea Fights of the Great War' co-authored by Wyllie and M.F. Wren (1918) facing p. 4. accompanying Wyllie's account of the occasion (pp. 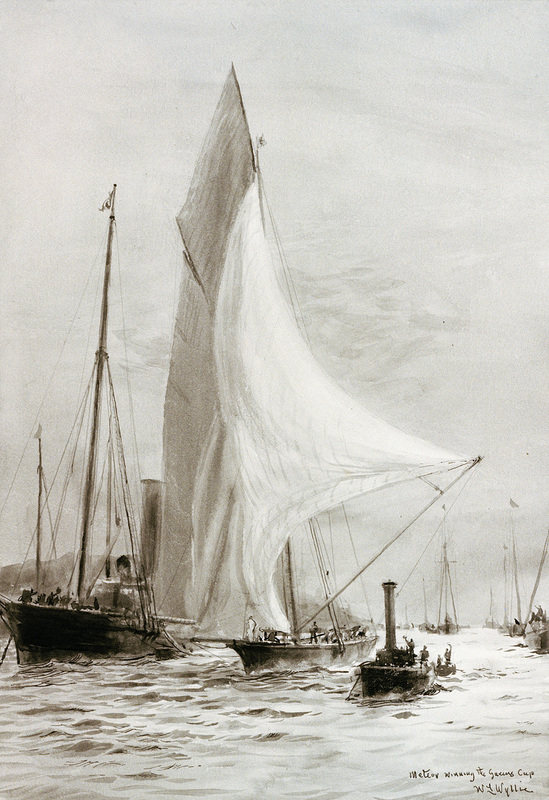 2-4), and specificaly how 'Meteor' passed through the crowded anchorage to do so - her boom rattling along the shrouds of a steam yacht to starboard (left here) and the spinnaker boom rapidly hoisted up to clear the funnel of the launch on the right. The figure in white standing on 'Meteor's' prow is the Kaiser. The drawing was probably done for the book, base on sketches done in 1893. At least three which Wyllie did on board 'Meteor' include the Kaiser: see PAE0232, PAE0233 and PAE0457. [PvdM 6/13].